Suppose you (as ) are pondering what move to make with this position. The move 22/16 6/1* is definitely a candidate, but you may wonder how much equity will you get after each possible 's roll. You input this position in Snowie and use the "Dice Panel" (see the picture below) to see equity after each 's roll. 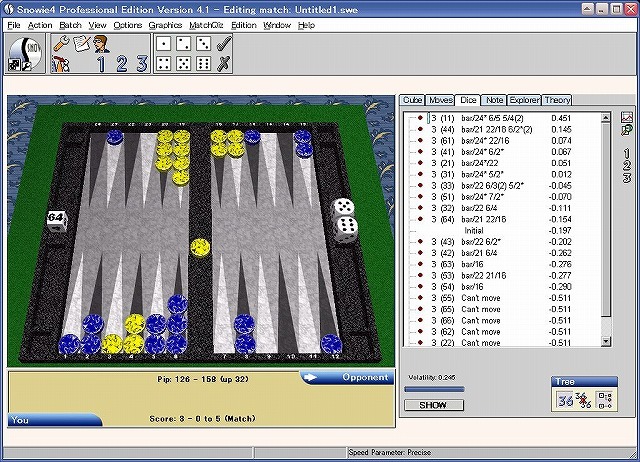 Cliking the button placed at the bottom right of the Dice Panel displays 1-ply equities for all 21 (for 15 non-doubles and 6 doubles) possible opponent's numbers in the panel area. In order to have Snowie to analyze all the 21 cases at 3-ply for more trust worthy results, select all lines in the Dice Panel and click the button at the right side of the panel. Here's the readout of the Dice Panel. Just reading out the Dice Panel doesn't give you much insight of the position unless you look into it very closely. The dice table method really is easier to see the whole picture of the position than just simple list of equity vlues, but still it is not very intuitive. Something can be done to make the table more intuitive or more visual, so it is much easier for us to see the characteristics of the position. I named this colored dice table method "Temperature Map", as an (forced?) analogy of temperature map in a weather forecast.